The cabin in Hope is located on 8 acres and walking distance from historical downtown Hope. Surrounded by beautiful mountain views and views of the Turnagain Inlet, you are in a quiet peaceful paradise. The cabin is open, spacious and newly remodeled. Downtown Hope comes alive with live weekend music and open mic night is a special Thursday treat all summer long. The historical Hope museum is filled with historical remnants from the gold rush area. Walking and bicycle trails are available all around this area waiting for you to explore. We have lived in Alaska for over 20 years. Alaska summers are magical and we continue to enjoy and explore this beautiful state we live in. 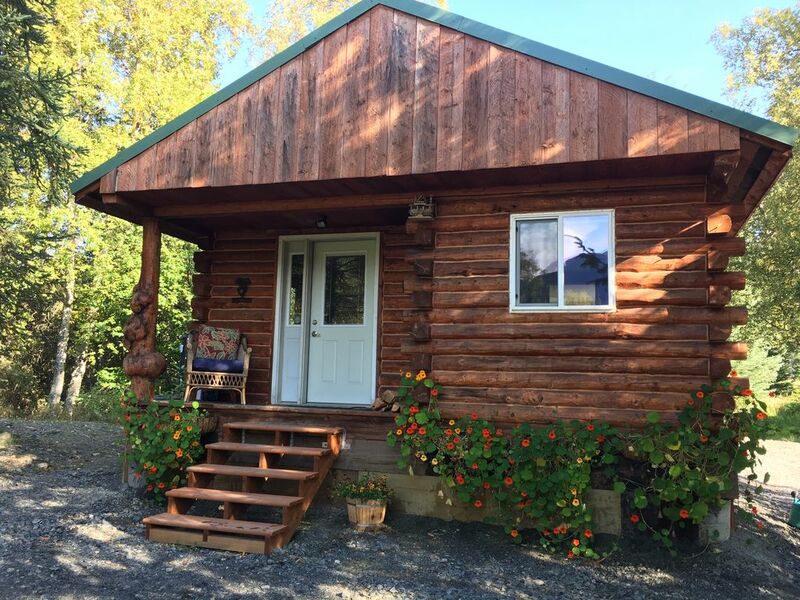 The cabin allows you the comfort and convenience while secluded in a beautiful, peaceful setting walking distance from downtown. Hope is a unique experience with all the history and wildlife to make it the quintessential Alaskan town. Gold rush buildings still charm downtown Hope. The log social hall built in 1902 still serves as the gathering place for community meetings, weddings, dances, and other events. 'Hope City' was a gold mining camp for Resurrection Creek, established in 1896. Compact refrigerator. Guests may consider bringing an extra ice chest for additional food storage. Mini convection toaster oven and microwave. The Cabin in Hope is your quiet, peaceful get away. Six mile creek river rafting is right down the road. Hiking and bicycle trails are located all over the area. Fishing guides are available for private fishing tours as well. Hope is a great location from which to base your Alaskan stay. Please discuss this when booking, we would love help customize your stay! As a couple who seeks value and something special, and appreciates thoughtful touches, we found the perfect place--The Cabin in Hope. We feel fortunate that we also had a very supportive host who answered all of our questions and provided more than we could have expected. The drive to Hope is special and the drive down the scenic road to the cabin is beautiful, leading to the cabin at the end of the road. Once at the cabin, surrounded by mountains, you walk into the cabin and see a comfortable, clean, and romantic setting. For a couple celebrating their anniversary, this could not have been better. Three things that stand out: the setting, the thought the host put into the cabin, and the best bathroom we have ever seen anywhere - a completely unexpected luxury to find in a cabin setting! We all look for clean accommodations (and this one certainly was clean), but when a place goes way beyond the basics, one feels a sense of being very grateful for the exceptional experience. Thank you so much! So glad you enjoyed it! Please come visit again! Had an awesome stay here at the cabin. The cabin had everything I needed, and was very clean and updated. I will hopefully be staying there again in the future. This was amazing and Dre was so great and helpful! The view was gorgeous and the town was adorable. Would definitely be back! Thank you! Thanks Michael ! Hope you got to see Denali!! Such a cute, peaceful cabin in a quant little town! This little cabin in the woods is perfect! Peaceful, cute, immaculately clean, such a great getaway! We enjoyed the mini kitchen with some unexpected extra drink/food items available and the outside fire pit. Our host was quick to respond to any questions/comments we sent. We also had a great time walking into Hope to watch people fishing in the creek, eat at the quant restaurants, see the museum, and visit with some of the people who live in Hope year round. I highly recommend this cabin! This cabin is gorgeous. It's the perfect size for a couple - well laid out to make use of the floor plan, with spacious areas for sleeping, lounging, and kitchenette. The owner was very welcoming when we arrived and gave us a tour, including recommendations for stops to check out in town as well. The bed was comfy, the bathroom was large and luxurious, and the homey touches of coffee/tea/creamer, luggage racks, and original artwork really made this cabin inviting. The view from the porch is phenomenal - like your own private slice of wilderness. We will definitely stay here again if we make it back to the Hope area, it was perfect! Whether your interests are in history, photography, salmon fishing, hiking or just sight-seeing, the historic town of Hope has something for everyone. You can cast a fishing line for pink salmon within walking distance of the house. For more serious fisherman, fishing excursions are available for halibut and other species of salmon. Famous local miner 'Peck' can show you how to pan for gold! Bring a camera. The Chugach Mountains and Turnagain Arm tidal flats boast eagles, moose, bears, mountain goats, and berries.